Just a couple of weeks after the Battle of Bunker Hill, there was an uneasy stalemate between the British troops and the American colonists as both sides took their measure and regrouped. The British stationed at Bunker Hill had a lovely view of the 20,000 Colonial troops and their sturdy fortifications across the Charles River. This would not be an easy rebellion to put down. Flyers circulating among the British soldiers distributed by the locals accusing them of “shedding the blood of your fellow subjects” and urging them to join their cause did little to help morale. They were short on provisions as well. But things could – and would – get a whole lot worse. On July 3, 1775, General George Washington rode out to the front of the American troops assembled in Cambridge MA and drew his sword, formally taking command of the Continental Army, a post he had agreed to a couple weeks before. He also agreed to take the job without regular compensation, only asking for reimbursement of future expenses incurred during his time as commander. There were those in the Continental Congress who disagreed with his appointment, citing his relative inexperience, which was a valid point. But Washington was from Virginia and it was hoped appointing him would help bind the Southern colonies closer to the New England states, increasing a sense of unity. Washington settled in a house recently abandoned by a Loyalist family. He was immediately inundated with visitors – everyone from local Bostonians to representatives from Native American tribes to a delegation including Ben Franklin. Ben and company posed an urgent question: How can we feed over 20,000 men? And even if we can feed them – can we keep them? Many were only enlisted for short terms and were eager to return home to tend their farms. Although General Washington gave every outward appearance of hunkering down for the winter, that was not the case. He was plotting and planning. He sent Henry Knox to Fort Ticonderoga to collect the artillery there and bring it to Boston where it could be put to excellent use. Knox completed his mission successfully in the most dreadful winter conditions. Diversionary tactics were employed to distract the British while fortifications were dug on Dorchester Heights, which had a clear shot over Boston Harbor straight into the city. 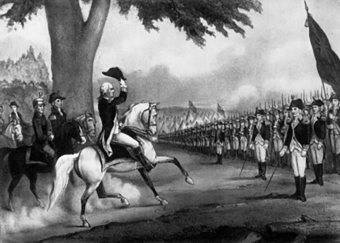 It was Washington’s first major victory since taking command of the Continental Army. Now he set his sights on New York, as the colonies began seriously considering the notion of Independence.